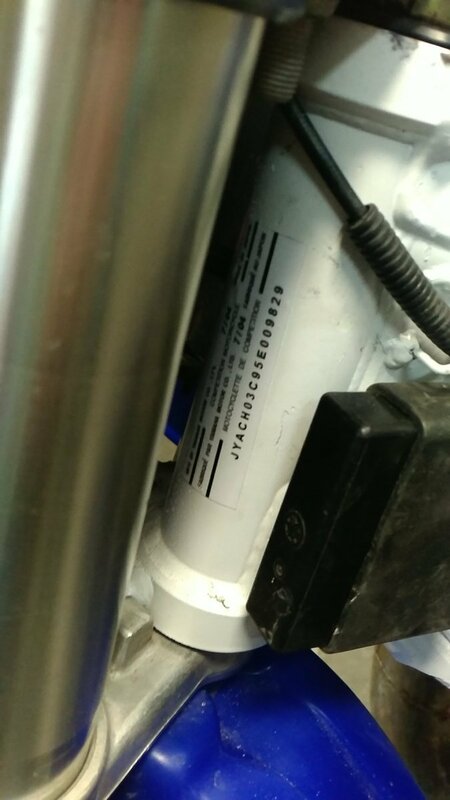 Hello, this is my first post but anyways three days ago I bought a nice dirt bike, said 2005 yz250 and the VIn sticker checked out, when I took it home and tried to insure it, they said the VIN was not real, so I looked on the other side where the stamped VIN should be and of course it's powder coated with white, so I grab a know and take off the powder coating and I see a slight amount of VIN with grind marks, but with the reflilextion of a flashlight I can make out every letter perfectly, so of course this is super sketchy so I wanted to talk to the police about it, but the weird thing is this VIN said my bike is a 1999 which now that I've researched I know it is, but it's also not reported stolen, anyways the police are going to want to dispatch a cop to come look tomorrow, do you guys think they can confiscate it? Yeah, unfortunately, they probably can. Whether they will or not is up to the discretion of the cop you're dealing with. A steel frame 2005 should have been your first tip that something was fishy..
Well, you have to sandblast steel before powder coating. Perhaps that's the reason why the vin looks tampered, and maybe the guy who sold it to you was just trying to hose you on the year (or maybe he got hosed on it as well and just passed on what he "knew"). In most places, a defaced VIN is not looked at kindly. Even if completely innocent. Best of luck. Be 100% honest with the police and try and work with them. They may see your honesty and try and help. It was a huge issue when it first got mandated but IMO it helps recovering stolen bikes and I know a couple of guys who lost bikes they honesty bought and turned out to be stolen when they registered then another couple of guys who got bikes back. When I registered my bike, no one actually looked at it for the VIN and this at some point this happened since 2005 on my CFR250R I I never really notice until a few years ago and most of the first of the vin is gone. Anyway as posted and for at the very least a piece of mind that you do not have a stolen bike, take it into the cops. First, what is this vin sticker that says it's a 2005 and where is it located? I'm not familiar with the YZ's, is there a cable that runs next to the VIN? Cables are known to wear the VIN off of certain bikes. From the looks of the pics......hope for the best and prepare yourself for the worst. This link will verify if the VIN has been altered. You can google other sites to check for stolen. Looks good so far, but thanks I'll prepare as best I can I suppose. If the VIN is clean you should be ok, but the phony VIN decal is problematic. If that hasn't been discussed with the law already, I'd disappear it. I can also tell from looking at the fake vin it says that the bike is in the 150-199cc category so pretty much it says it a two hundred. 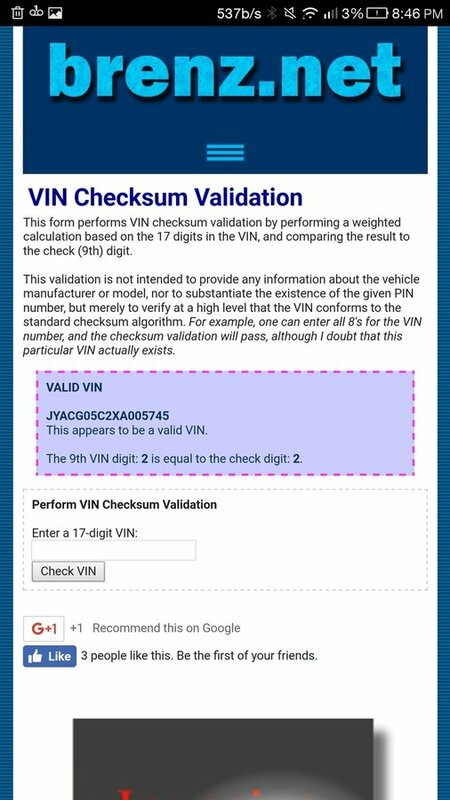 generally if you know how to decode a vin number you can normally tell if someone is lying or if it is probably stolen. you got really lucky this happened to me because I was so excited to get my first dirt bikes a 1990 xr200r and a 1995 xr200r and I had worked my a*s off for them and begged my parents for so long to let me buy one. I got there and checked them for spark and stuff like that but not once did I think to look at the Vin's or ask for the title when I got home my Dad was like did you get the title and I just went quite and he said oh god there probably stolen and I started freaking out but luckily when I checked them they both came up as clean titles. Police are there to prosecute, not to nessesarily help you,, they are paid to prosecute. They help you when they prosecute someone that you want prosecuted, otherwise they question you with friendly face to see if they need to prosecute you. This is real and true, if you don't belive me now, you will believe me one day. As Markmc2 stated, don't invite the man into your life even for a doughnut or coffee, just keep walking even if you are an upstanding man, keep walking, trust me, words of wisdom. Words of wisdom for you, thats just ignorant! So thank goodness this guy's tampered Vin is coming back as not stolen. If he seen the tampering, and didn't know to check the website to see about the vin, and let's say it does come up as stolen. The police take the bike, yes they seize the bike. Ignorance or know what happens.